I fired my new Kipor generator up for the first time on Sunday evening. I have to admit that the 35kg dead weight now the petrol tank is full is something I won’t be moving very far. My original plan was to carry it from the engine room to the front of the boat each time I wanted to use it so that I could plug it into the shore line which we have running from the back of the boat along the roof and under the cratch cover to where the plug is coiled neatly on top of the bow locker. Then I remembered that I won’t need to. When we set sail next April we won’t be using the national grid very often so the boat length shore line will be coiled neatly out of sight in the engine room. I’ll just get another much shorter cable made up to reach from the generator on the towpath near the back of the boat to the socket in the engine room. Wherever I use the generator it will be chained to something immovable but I’m considering running it on my tiny back deck rather than off the boat. Chained or not, if I have it running on the towpath it’s much more accessible to potential thieves if it’s off the boat. I don’t intend using the machine when both Sally and I are away from the boat so if it’s running on the back deck, anyone with an unhealthy interest in it will have to step on board to get at it. Anyone stepping on to the boat is very noticeable from inside. I’ve decided to run the generator on propane rather than petrol. I’ll always have propane on board to cook with and there’s plenty of spare space in the bow gas locker for additional cylinders. I have two 13kg in there for cooking; one in use and a full spare. I’ve just purchased two 6kg cylinders to use exclusively for the generator. I had to sit down after I was presented with the bill. Because I wasn’t exchanging an empty cylinder for either of the new bottles I had to purchase a license for each. Each license cost me £32 . The total cost of the two licenses and two 6kg cylinders was £110. I also needed to purchase an LPG conversion kit for £150 which I wasn’t terribly happy about but the expenditure makes sense in the long term. The generator is 30% cheaper to run on propane than on petrol, propane is readily available at boat yards up and down the cut and it’s safer to store on board than petrol. Thank you Dave Bradshaw for pointing out that there’s sometimes an issue running generators on propane once the pressure in the cylinder drops. I’ve taken that into consideration but reached the conclusion that I’ll still be able to use the partial cylinders which won’t work on the generators for cooking instead. Talking of cooking on gas, I changed one of my 13kg propane cylinders on Tuesday. The fact that I changed a gas cylinder wasn’t unusual. The fact that I last changed one before that back in June is very unusual indeed. In June I had my gas water heater taken out and had a calorifier installed to heat my boat’s water. When the gas heater was installed I changed my gas on average every twenty one days. With the heater removed, the gas lasted me ninety days. I don’t know how much propane there was in the cylinder when the heater was taken out but I don’t think it was quite full. The current cylinder should last even longer. The cost of our gas per day was £1.28. Now it’s 30p. The yearly cost of my gas before was just under £500. Now that I’m just using gas for cooking, the cost will drop to just over £100. The saving will pay for half of my waterways license. I’m very happy. Now where was I when time beat me again last week? Oh, that’s right, I was talking about the dangers of walking along the gunnel or roof of a snow or ice covered boat. The frozen stuff makes the outside of the boat very slippery, but so does summer rain and even early morning dew. I see hundreds of hire boats passing through the Calcutt flight of three locks. For many of the hirers coming from Black Prince at Wigram’s Turn marina or Napton Narrowboats at Napton marina, Calcutt Top Lock is their first ever lock. Many of the boats have teenagers or younger children on board. Many of them spend much of their time in the lock jumping to and from the boat roof and the lock side. This practice is dangerous at the best of times. I’ve seen several dogs in the lock as a result of slipping from the lock side or the gate and one boater slip from the lock side six feet on to the roof of his boat in the empty lock. All of the accidents were on dry days when surfaces were relatively slip free. As soon as there’s any moisture on the boat roof it changes from a relatively slip free platform to a skating rink. The lock sides often have moss or lichen growing on them so a little rain or dew on the organic growth makes it equally as slippery. Wet surfaces make locking quite a hazardous affair, but not nearly as much challenge as when there’s a stiff breeze blowing. Windy days and narrowboat cruises are not good companions. Throughout the spring, summer and autumn, every Saturday we have groups of hirers coming to Calcutt to take one of our boats out. Regardless of the weather the boats go out. We don’t have to worry about ice or snow at that time of the year. Sometimes there’s a little early morning frost to make climbing over the boats in the morning a little more of a challenge as we prepare them for the afternoon but the frost has gone long before the first hirers arrive. Rain, although a little inconvenient, doesn’t prevent us instructing the hirers and sending them on their week or two week long cruises, but strong wind makes things very interesting indeed. 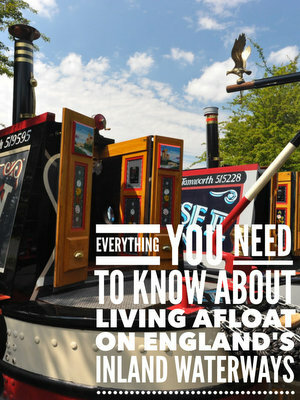 The majority of narrowboats are flat bottomed. They don’t have a keel and they don’t sit very deep in the water. James is considered to be quite a deep drafted boat these days. My 2′ 6″ draft is nothing compared to the four or five feet common in the working boats two hundred years ago but there was much more water and much less silt beneath the craft then. The deeper the boat’s draft, the less the wind will push it across the surface in directions other than the one you want it to go in. The bigger the boat, the more the wind has to push against. On James the cabin is 48′ long and about four feet high above the gunnel. The cabin alone provides one hundred and ninety two square feet of “sail” for the wind to push. Steering a narrowboat on windy days is a challenge for even seasoned narrowboat owners so at Calcutt we’re always a little nervous when we take first time boaters out for their half hour helmsmanship tuition. The wharf where we moor our hire fleet is directly beneath Calcutt Top Lock. Our boats are moored stern in at right angles to the lock. Each has another hire boat tied either side. On a calm day it’s a tricky operation to get the new hirers off the wharf. There’s about fifty feet of clear water in front of the boats to allow passing traffic a clear channel along the canal but there isn’t enough space to turn the boats to get into either the top or the middle lock. Our technique is to get the novice boater to start the engine while we untie the four or five ropes holding the boat in place and then put the boat into gear before very cautiously edging forward towards the concrete lined towpath ahead of us. The instructor stands on the bow indicating to the helmsman how far the boat is from the concrete. We use hand signals because the person steering can rarely hear what’s being said from the front of the boat over the engine noise. If we time the manouver correctly, if the helmsman is watching attentively and if the attentive helmsman actually understands the hand signals, we ask him to stop the boat just before the bow touches the concrete and then leap gazelle like from the bow onto the towpath and then push the bow around until the boat is parallel with the towpath which allows the helmsman (it’s nearly always a helmsman. I ask the hirers to nominate one person to steer the boat and one or more people to work the locks for this part of the instruction. If there’s a lady present I can almost guarantee that she’ll look like a startled rabbit and instantly offer the services of her husband or boyfriend to do the steering) to step off and hold the boat while I take the nominated crew up to the lock to demonstrate its operation. It’s a tricky manouver made even more interesting on a windy day. The prevailing south westerly blows from the wharf side towards the towpath so the slow moving boat is given a bit of assistance which that isn’t really welcomed at this stage. Added to that, a novice hirer’s idea of moving forward very slowly isn’t quite the same as mine. What they haven’t learned at this stage is that one of our hire boats, weighing between ten and fifteen tonnes depending on the length, takes a bit of an effort to get moving and then once it’s moving an equal amount of effort to stop it. Because the boat doesn’t move forward instantly when they apply throttle, they push the Morse control forward until the wind assisted boat is moving towards the concrete bank opposite at a speed Usain Bolt would have problems matching. Once I’ve helped the crew set the lock I then get back onto the hire boat to help the helmsman guide the boat in. If the prevailing wind is reasonably strong it pushes the boat against the bank so we have to compensate for the wind by giving the leading edge of the cabin a very hard push, hoping that by the time we get on to the back of the boat ready to move forward that that wind hasn’t pushed the bow back in again. At this stage the helmsman has often had no more experience handling a boat than the fifty feet charge from the wharf to the towpath. Now he has to move the boat from the towpath and line it up with the lock just twenty or thirty feet away. I usually suggest that he goes as slowly as possible to reduce the force of the impact if he gets it wrong. Unfortunately, the slower the speed the poorer the steering and the greater the effect of the cross wind. It’s often a fine balance between moving forward slowly to reduce the likelihood of any damage occurring and moving quickly enough to maintain any kind of control at all against the wind. Once the boat is through the lock, usually with a little bump on the way in, I stay on the boat for 450 metres (I’ve just measured the distance on Google Maps) to where we step off at a point where the canal narrows by the base of a dismantled railway bridge. It’s a short distance but long enough to establish whether the helmsman is comfortable handling the boat and to give some last minute advice about speed limits and how to pass moving and moored boats. The short stretch of canal passes the exposed forty acre Napton reservoir. If the wind is buffeting the boat when we leave the lock I know we’re going to have to do a bit of crabbing when we reach the exposed bank next to the forty acres of reservoir water next to our grounds. I try to assume a nonchalant air as the wind whipped water on the canal in front of me draws ever closer. I casually point out the small waves marching ahead of our bow and mention that a little corrective steering is needed on gusty days. I encourage the novice helmsmen to steer into the wind as we surge up the canal past the reservoir at forty five degrees. I laugh and joke but all of the time I’m thinking, “I’m really glad this isn’t my boat!”. Many boat owners with plenty of time on their hands simply stay put in strong winds and heavy rain. They don’t often have appointments to keep so if it’s not pleasant cruising weather, they simply don’t cruise. Not everyone has so much time on their hands though so sometimes they have to set off in inclement weather. I quite like rainy day cruises. I have a Guy Cotten 100% waterproof jacket and trousers. They’re bright yellow. You see deep sea fishermen using them to keep dry at sea. They’re bomb proof. I can stand all day on the back of the boat in the heaviest rain without a drop getting through to me. They’re great for standing immobile for hours on end but not very good if I do anything involving physical exercise. Five minutes of lock wheeling would have me dripping in sweat. If wet weather lock work is required I can switch to my more breathable but not quite as waterproof Kakadu drovers coat and hat. Wet weather is just an inconvenience but windy days are a pain. On a still day you can pass moored boats and enter and exit locks at a slow and careful pace. If you try the same manuouvers on a day with a strong cross wind, you’ll end up missing lock entrances and crashing into parked boats. With moored boats it’s Hobson’s choice. You can pass them at the recommended tickover and accept that the cross wind is going to blow your boat into them, in which case you’ll be subjected to cursing from inside the moored boats, or you can increase your pace to maintain some steerage, in which case you’ll be subjected to cursing from inside the moored boats. You choose. By increasing your speed when entering locks you’re less likely to be blown away from the entrance, but you have to be confident that you have the right line going into the lock. If you get it wrong you’re going to hit an inanimate object harder than you would if you’d been going slower and then blown off course by the wind. The same applies to getting into a mooring on a windy marina. It’s easier to maintain your line if you increase your speed but you have to be accurate in the first place, and you have to be able to stop quickly once you enter your mooring space. A boat here at Calcutt came to a very sudden stop last year when the owner adopted this approach. He judged his line correctly and accurately entered his mooring at speed then threw the boat into reverse to stop it quickly… just as the Morse control came off in his hand. The fifteen tonne boat didn’t do the wooden walkway any good at all. Getting into our marina is interesting on a windy day. The prevailing wind usually blows out of the marina entrance so turning the boat into the wind can often be a challenge, especially if you’re coming out of Calcutt Bottom lock towards the entrance. As soon as you come out of the lock, the wind pushes the boat’s bow away from the marina entrance towards the towpath. A occasionally effective solution is to reverse the boat back into the lock mouth, use the lock landing to pivot on until the boat is lined up with the lock wall, then charge out of the lock before the wind pushes the bow in the wrong direction. Sometimes the bow just won’t come round. It’s often easier to work with the wind rather than fight against it so if the wind pushes the bow into the towpath it’s possible to kick the stern around into the marina entrance and reverse through. I was discussing handling narrowboats generally and handling them in challenging weather specifically with a guy who came on a discovery day a couple of weeks ago. He had owned a GRP cruiser for a number of years and was horrified at the though of so much contact between the boat and immovable objects, especially intentionally making contact with them to help turn or straighten the boat’s line. That’s the difference between the two types of craft. A narrowboat doesn’t handle very well in challenging weather but it’s usually solidly built so can shrug off light contact below the gunnel. A plastic cruiser is far more manouverable but it has to be handled as though it’s made of glass. I would rather have the reassuring weight and substance of a narrowboat any day but given a choice I will always try to avoid taking one out in particularly bad weather.